Assumption welcomes a new recruiting system to help students develop professionally. The CDIC switched from Career Connection to Handshake in June based on student input. This system can be used by all Assumption College students and alumni. Current students can automatically sign in with their Assumption ID and password. Handshake is used by more than 500 career centers and features over 250,000 employers. The system is easy to use and personal. Employers request to recruit at certain colleges and universities. Then career center staff approve companies and jobs to be featured on their campus’ Handshake. Each employer has chosen to recruit Assumption students and has been screened by a member of the CDIC staff. 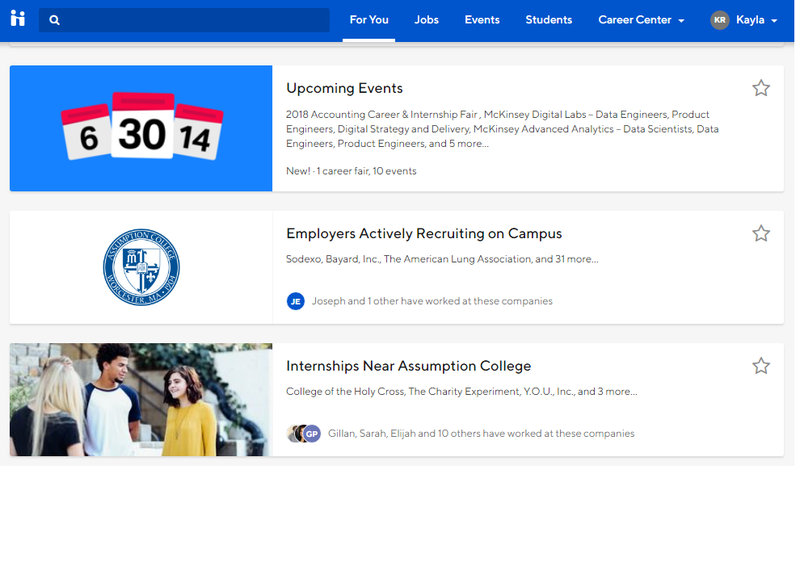 Handshake makes it easy for students and alumni to personalize their professional profiles, filter jobs and internships, schedule appointments and register for events. Sign up for Handshake today with https://assumption.joinhandshake.com/login, the Handshake mobile app, or the Login to Handshake link on the CDICEdge!